What an adventure filled Saturday I had!!!! 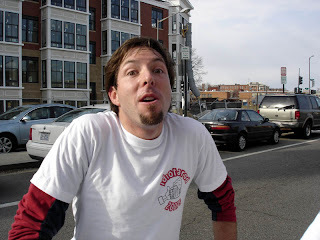 A few friends from work allowed me to join their team to compete in the 2007 DC Idiotarod. It is put on by a great group called SMASHED. I wasn't really sure what to expect, so I wavered in joining the team, but I am so glad that I did now. Here's an article from the Post about the race. ***If you don't know what this is, then click the links above before you keep reading!! It all started on Thursday when we came up with a theme for our team and we ordered some fabulous team shirts. 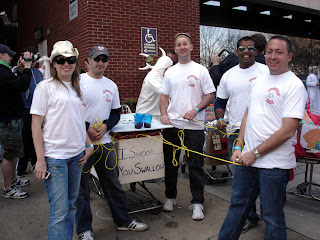 We came up with a slogan, "Drinking for charity makes me feel good about myself!" and I got to work on planning how the cart would look. That night, Sean and Larissa did the dirty work and acquired the cart from the Safeway near us. I started preparing the cart on my day off on Friday with a trip to Home Depot to get the necessary materials to make my decorations. 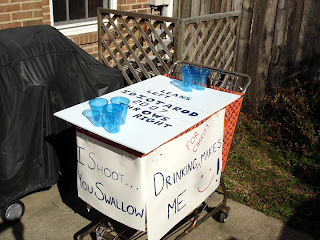 We decided that we would put a mini beer-pong table on the cart and make posters to attach to the sides. I built the little table, painted it, and attached it to the cart with a cool zip-tie systems. We were all set for Saturday. We started by a few of us meeting at my house to make sure we had everything together and we got some sustenance in the form of Mimosas. I velcro-ed 6 plastic beer pong cups to the top of the table and Larissa had the good idea to make jello to put in them! After that was done, we gathered everything up, threw the cart into Joey's Xterra and piled in with it. Off we went into the city to check in with the mayhem. There were some pretty stellar carts and some scary costumes getting lined up in the start grid. After getting checked in, we stopped in the Front Page to hydrate ourselves for the race. The organizers wanted us all lined up in the grids 15 minutes before the race started. There were 2 different race courses and a leisure course. We were on the front row of racer course B, a good starting position. They gave us a clue to a mystery location that we had to get to to receive the list of bar checkpoints that we had to go to. Of course, during the time waiting for the start, there was plenty of sabotage going on! There were super soakers being shot all over and water balloons were being tossed. This was where we were affected. A well placed balloon struck right in the middle of the pong table and took out my cups. We through them inside the cart and were ready to go for the start! The horn blew right at 2:30 and off we went. It was a mess getting out of the gate, so it was a good thing we were in the front. 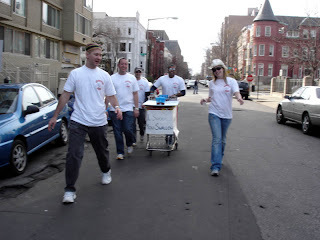 Our mystery location was the Scottish Rite's Temple on 16th and R. We headed out around the circle and were almost in the lead. We were lucky enough to be just out of range of the eggs that were flying from behind us. We made it to the temple in 2nd place, but lost a team member on the way, so we couldn't get the list. Once we figured out where we needed to go, we took off just as lots of mayhem was going on in the line at the temple. After taking off on a rapid pace again, we quickly decided that we would not be able to keep up the race pace and we were going to go at a leisure speed. It might have had something to do with all of the hydration that we had been doing all morning! The first check point was Lucky Bar at which we decided that since we were taking an easier pace, in our 20 minute "rest", we would have a shot and a beer. This was where our entourage, aka Nick, joined us for the rest of the race. As we were leaving, a team from GW, dressed in Colonials stuff tried to tie us up with caution tape! Luckily I pulled out the fellow Colonial card and we were spared!! 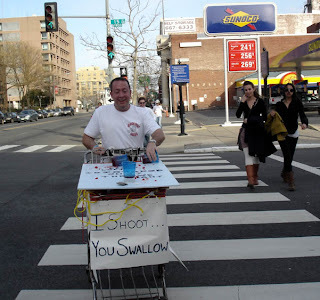 We chatted briefly and then headed to Solly's U St. Tavern, the next checkpoint. We knew that we would see the GW team again... This was the longest distance in the race and we had a good time cruising down the sidewalks. However we definitely needed to take some breaks on our way there. Again, must have been the hydration we were getting! The next checkpoint was the most crowded, because all teams were headed there. By the time that we got there, we could tell about where we were going to finish up in the results. It was crazy out front with plenty of sabotaging going on! We were the recipient of a little of that while we were inside hydrating more with our beers and shots. We had one more checkpoint to go before the Finish Line. Off we went to Tom Tom! This is where things start to get a little fuzzy and run together... For some reason, I was given 2 shots to do at this checkpoint! Off we went to the Finish Line at Chief Ike's Mambo Room. The party was hopping and there was free beer in several kegs until that ran out! We ran into the GW team again and hung out with one of their members for a while, before Nick and I had to head off to the hockey game. We decided to bring the GW teammate with us and off we went! 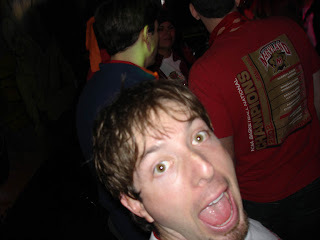 I remember the game being pretty bad, the Islanders rolled over the Caps. We went to another bar to meet one of Nick's friends for a little while and then he went off to another party and I escorted our friend back to GW. It was an awesome day!! And what is even better is that we raised money for charity. I am already looking forward to next year's race!!! All in all, out of over 80 teams, we came in 60th place. (Leans Left, Throws Right) But what really matters is that we had FUN. Here is a link to lots more photos from the race. Tyler - You are crazier than I thought. A true athlete mixing physical endurance with beer bonging. What next? See you in Seattle this summer?